We were anchored in a huge bay called Cape Bowling Green off the East Coast of Australia. “Looks like a great place for fishing,” Denise said, turning to he pole with excitement. The bay was very large, possibly a square mile with only a thin hard sand spit protecting it on the seaward side. Hard enough for locals to drive vehicles on and there were plenty of them dotting the horizon. Likewise for beach chairs occupied by bronzed pot bellied Aussies with a brew in hand and a couple of fishing poles anchored in the sand. We had set our hook in about 30 ft. Denise, who loves to fish, shortly had a line out to starboard that she was semi tending as she also devoured the latest Harold Robbins thriller. Multi tasking as only women can. Another tough day in the tropics. Brandy, our Caviler King Charles Spaniel lay on deck at Denise’s side. The pole wiggled. Almost imperceptibly. Multi-tasker Denise didn’t miss a beat, “Fish on the line” she hollered I was the only other living soul within earshot so I dropped my wrench (something I was aching to do anyway) and came to assist Denise. “Got a good one there kiddo” I guessed. Hell yes we’ll keep it, damned good eating & the head will be nighttime bait for the big one! Denise worked the angry two foot shark alongside and I swooped it into our net with little problem. Brandy by now was yapping away – quite excited to have a new play mate. Normally we would fish bat the catch to it’s eternal resting place while in the net, letting it’s final wriggles take place before filleting it. Not with a shark though. They have a habit of coming back to life and taking a chunk of their keeper. So we pounded it a few times with the fish bat and left it in the net partially hanging over the starboard side. Denise checked her bait and dropped the line in again. Almost immediately she had another strike. I jumped below for my knife, returning topsides Denise was lowering the dreadful looking snake into the net with the still quivering shark. “We may have to dump the whole mess” I said, advancing cautiously with my knife. “Look at the shark. It’s going nuts! And we thought it was dead. He doesn’t like sharing his bunk... that’s for sure. It is said a sea snake can only bite between the fingers or toes…someplace it’s small jaw can fit. At that moment Denise and I saw something we had only read about. The sea snake unhinged it’s jaw, opened wide and viciously bit the shark just in front of his tail. The shark visibly shuddered and in 30 seconds or so lay silent and very dead. The snake had his head and about 8 inches of his body through the net. I took a swing with my long knife severing the snakes head cleanly. It fell into the bay while the bloody body kept writhing away for another ten minutes or so. Here’s the freaky part. 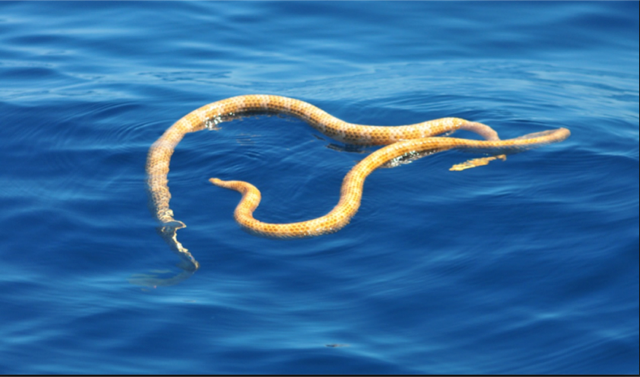 Denise looked over the side where the head had flown and there, with heads just above water, were perhaps a dozen more sea snakes darting around as if looking for the source guilty of killing their mate.